While athletic training students are formally enrolled in the athletic training program students will complete six semesters of clinical educational experience. The utilization of the clinical educational experiences at George Fox University provides the primary setting for the continued teaching, practice, and evaluation of entry-level athletic training competencies and clinical proficiencies. Clinical educational experiences will typically begin during the fall term of the student’s sophomore year. Students have daily direct supervision by a Preceptor and the opportunity for on-going feedback and guidance. Supervising Preceptors afford adequate supervision to assure that the athletic training student performs his or her tasks in a manner consistent with the Standards of Practice of the profession of Athletic Training. Two elements compose the clinical experience in athletic training: Academic Coursework and Clinical Education. George Fox administers clinical education over six semesters at approved clinical affiliates. Each semester athletic training students enroll in a Practicum courses for one to three credits, depending on their semester in the program. These courses integrate cognitive, psychomotor and clinical proficiencies in a didactic setting and then the student will apply their skills within their affiliated sites under the direct supervision of a Preceptor that involves patient care. The clinical education program includes the presentation and evaluation of the Entry Level Athletic Training Competencies and Clinical Proficiencies. These competencies and clinical proficiencies will be instructed, assessed, and applied in a progression over time. The clinical experience provides those clinical education experiences for the athletic training student that involves patient care and the application of athletic training skills under the supervision of a Preceptor. The instructional plan of the athletic training major provides for the sequential acquisition of the content and clinical proficiencies required to perform as an entry-level athletic trainer. The plan integrates coursework and clinical educational experiences. Academic Coursework: The athletic training student takes a required block of courses each semester that the athletic training student is formally enrolled within the athletic training program with each semester’s coursework building upon the knowledge and skills acquired in previous semesters. Appropriate assigned athletic training educational competencies and clinical proficiencies are incorporated into each course. Courses will include laboratory experiences that expose the student to designated competencies. Athletic Training Practicum (I-VI): At George Fox University the student gains clinical education through six semesters at approved clinical affiliates. 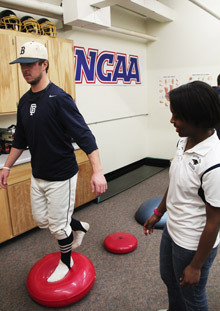 The student will register for a Practicum course each semester while formally enrolled in the athletic training program. Each Practicum course includes a didactic component as well as clinical educational experiences. Clinical education integrates clinical proficiencies both didactically as well as within their affiliated sites. Athletic training students learn under the direct supervision of a Preceptor and when possible involves patient care. HHPE 374 Athletic Training Practicum I (1 credit): Include the following clinical content areas: acute care and management of athletic injuries, injury prevention, emergency action planning, Christian faith and vocational practice. During this term, the student will be assigned to a Preceptor at the George Fox University athletic training room and will be exposed to protective equipment, individual and team sports, and male and female student athletes. During the semester, the student will also present medical cases to the team physician during his/her weekly athletic training room evaluations of student athletes. HHPE 375 Athletic Training Practicum II (1 credit): Include the following clinical content areas: acute care and management of athletic injuries, injury prevention. During this term, the student will be assigned to a Preceptor at a George Fox athletic training room and will be exposed to protective equipment, individual and team sports, and male and female student athletes. The student will also complete a rotation with the Newberg Fire Department which includes conditions other than orthopedic and non-sport patient populations. During the semester, the student will also present medical cases to the team physician during his/her weekly athletic training room evaluations of student athletes. HHPE 376 Athletic Training Practicum III (3 credits): Include the following clinical content areas: assessment and evaluation of the lower extremity sports injuries, and nutrition. During either the third or fourth term, the students will be assigned to an affiliated high school and will be exposed to protective equipment, individual and team sports, and male and female student athletes. When not assigned to the high school, the student will be assigned to a Preceptor at a George Fox athletic training room and will be exposed to protective equipment, individual and team sports, and male and female student athletes. During the semester, the student will also present medical cases to the team physician during his/her weekly athletic training room evaluations of student athletes. HHPE 377 Athletic Training Practicum IV (3 credits): Include the following clinical content areas: assessment and evaluation of the upper extremity sports injuries and general medical conditions/pharmacology or therapeutic interventions (depends on academic year offerings). During either the third or fourth term the student will be assigned to an affiliated high school and will be exposed to protective equipment, individual and team sports, and male and female student athletes. When not assigned to the high school, the student will be assigned to a Preceptor at a George Fox athletic training room and will be exposed to protective equipment, individual and team sports, and male and female student athletes. During the semester, the student will also present medical cases to the team physician during his/her weekly athletic training room evaluations of student athletes. HHPE 378 and HHPE 379 Athletic Training Practicum V and VI (3 credits): include the following clinical content areas: organization and administration, psychosocial issues, evidence based practice, professional development, and general medical conditions/pharmacology or therapeutic interventions (depends on academic year offerings). During either the fifth or sixth term, the student will be assigned to a 4 week clinical rotation with Oregon Health Sciences University in which they will be exposed to conditions other than orthopedic and non-sport patient populations. During either the fifth or sixth term the student will also be assigned to a Preceptor at a George Fox athletic training room and will be exposed to protective equipment, individual and team sports, and male and female student athletes. Students will also be assigned during the semester to a general medical facility with exposure to different populations and genders. During the semester, the student will also present medical cases to the team physician during his/her weekly athletic training room evaluations of student athletes.